Our friends over at iZotope have produced an updated Mastering Guide for 2013. 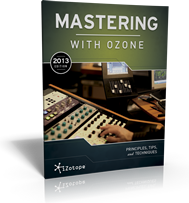 The new 2013 Edition of our free guide, Mastering with Ozone, has arrived! Featuring fresh insights from Jonathan Wyner and other mastering pros, the revised guide covers a broad range of mastering principles and best practices, plus a healthy dose of Ozone 5 tips.